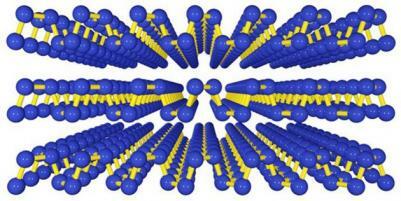 Researchers from Purdue University developed a new graphene-like 2D material from phosphorus. They call the new material phosphorene and they say that this is the first native 2D p-type semiconductor, making it more useful than graphene to make transistors. Together with MoS2 (a 2D n-type semiconductor), it is now possible to build switches made from 2D materials. Graphene in its basic form is a superconductor and so is less suited to make transistors. The researcher produced phosphorene and started studying it. It has a much lower electron mobility than graphene, but it's around 3-5 times higher than MoS2 and about 3 times higher than silicon and so this is a promising material. The researchers continued to actually create an inverter (a simple circuit element) by depositing MoS2 and phosphorene on the same silicon wafer.